One of my Facebook friends posted about signing up for a one way trip to Mars, and I thought, "Oh, you joker, that's funny." I still had to follow the link, of course. According to Yahoo Travel, the trip is real, but won't take place until 2023, and over 20,000 people have already applied. I checked the date and it wasn't written on April Fool's Day. That, of course, doesn't mean it's true. I googled, and was surprised to find piles of articles about it. The website spaceindustrynews.com seems to take it seriously, and talks about the company's creative way to get funding through selling advertising space. "It will be the most elaborate reality TV show of all time. The whole thing will be like The Real World in space with no way to get home. There will be no return shuttle, there's no hope of escape if anything goes wrong. These people will live the rest of their lives on Mars as pioneers and will die heroes and explorers." The article on Yahoo Travel says, "Although the trip and training sound daunting, the requirements for candidates are wide open: if you show resilience, adaptability, and curiosity, you might qualify. Scientific and astronaut's skills, however, are not required." The general idea is that four settlers will be launched in 2023, and four more every second year after that. In order to apply, one must be at least 28 years old, over 157 cm tall, and have 20/20 vision. 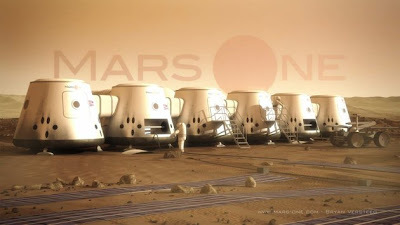 If you want to read more about this, check out the Mars One website, their Facebook page, and the Yahoo Travel article. There is also an interesting article here, discussing the problems these colonists would face. Real or hoax? You tell me. Would you want to go?